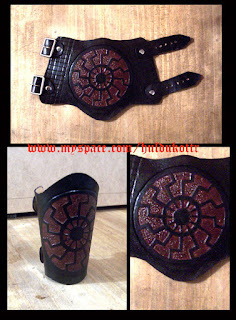 Today's bracer is another classic one. The also well known Sunwheel. As all of you must know, sadly this symbol was misunderstood by the Nazi party in 2nd W.W. They took its meaning as representing the Arian race and so on... but the truth behind this is that this wheel is found in many places around the world such as Japan, India, places in Asia in many and diverse forms. In our case about Germanic traditions, at least represents a cicle of time: life-growing-death, or the year harvest. It is also a symbol of strenght and protection over adversity. Anyway, it never could be understood as a symbol of hate o racial supremacy.